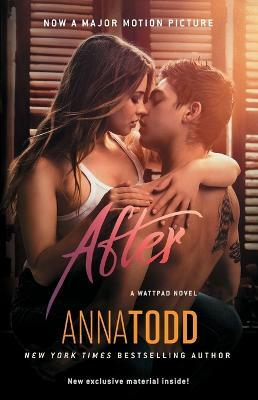 Experience the internet's most talked-about book, now a major motion picture, from Anna Todd, the writer Cosmopolitan called the biggest literary phenomenon of her generation. There was the time before Tessa met Hardin, and then there's everything AFTER... Life will never be the ... read full description below. Experience the internet's most talked-about book, now a major motion picture, from Anna Todd, the writer Cosmopolitan called the biggest literary phenomenon of her generation. There was the time before Tessa met Hardin, and then there's everything AFTER... Life will never be the same. #Hessa Tessa is a good girl with a sweet, reliable boyfriend back home. She's got direction, ambition, and a mother who's intent on keeping her that way. But she's barely moved into her freshman dorm when she runs into Hardin. With his tousled brown hair, cocky British accent, and tattoos, Hardin is cute and different from what she's used to. But he's also rude-to the point of cruelty, even. For all his attitude, Tessa should hate Hardin. And she does-until she finds herself alone with him in his room. Something about his dark mood grabs her, and when they kiss it ignites within her a passion she's never known before. He'll call her beautiful, then insist he isn't the one for her and disappear again and again. Despite the reckless way he treats her, Tessa is compelled to dig deeper and find the real Hardin beneath all his lies. He pushes her away again and again, yet every time she pushes back, he only pulls her in deeper. Tessa already has the perfect boyfriend. So why is she trying so hard to overcome her own hurt pride and Hardin's prejudice about nice girls like her? Unless...could this be love? Anna Todd is the New York Times bestselling author of the After series, The Spring Girls and The Brightest Stars. Always an avid reader, she began writing stories on her phone on Wattpad, the reading and writing multi-platform for original stories, with After becoming the most read series on the platform with over 1.5 billion reads. After has been published in over 30 languages, with more than 10 million copies sold worldwide, and is a #1 bestseller in Italy, Germany, France, and Spain. The film adaptation of After, which Anna is co-producing, is set to be released in early 2019. Anna and her husband currently live in Los Angeles. Find her at AnnaTodd.com, on Twitter at @Imaginator1d, on Instagram at @Imaginator1d, and on Wattpad as Imaginator1D.